On the helm of being awarded as one of the 100 Most Influential Filipina Women in the World Award by the Filipina Women’s Network, CEO and Founding President of Faith in God Ruby Pacis Montalbo Professional and Technical Services Corporation (FIGRPMPTSC) Ruby Canteras Pacis, receives another coveted recognition as one of the 2018 Ambassadors Choice Excellence Awardee honored by the Asia Pacific Council, World Council for Excellence Award Ministry and the ACSR Humanitarian Service Ministry. These award-governing bodies recognize exemplary practitioners who made significant contributions to their respective fields of expertise. 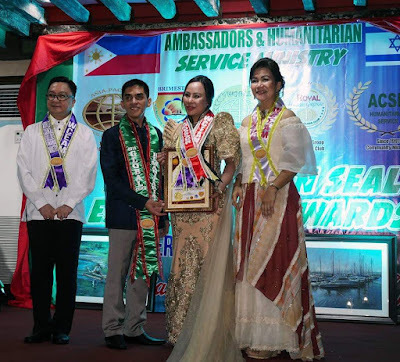 It is divided into three major divisions, namely Asia-Pacific, World Council and lastly, the ACSR Humanitarian Servant Ministry Council. 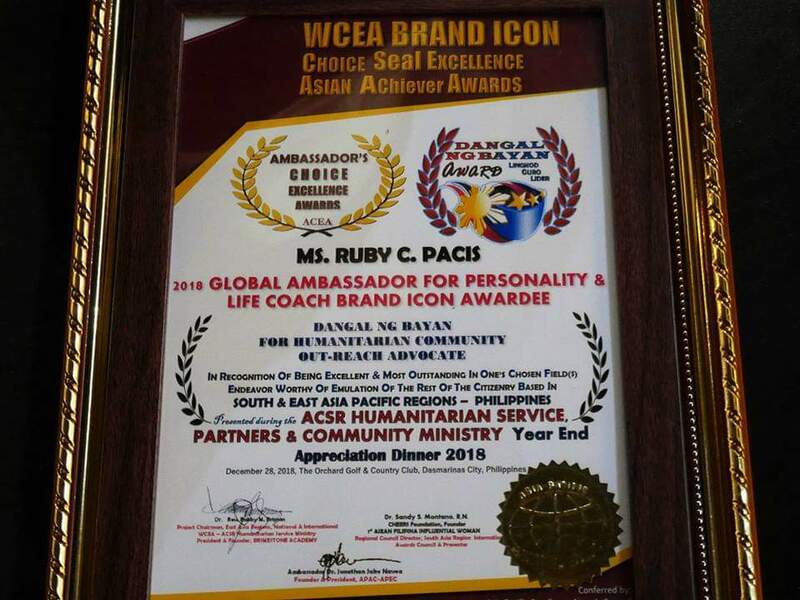 Among the 300 nominations in the South & East Asia Pacific Region-Philippines, Pacis was also selected as one of the Top 25 recipients of the 2018 Most Outstanding Model Icon for Life Coach, as well as the Outstanding Asian Achiever Icon, Leadership Excellence Business Service Provider and Model Life Coach Practitioner. Pacis was nominated by Asian Ambassador Dr. Sandy S. Montano. “When I received the award, my initial reaction was I cried. Because this isn’t about popularity, it’s about how I recognize my Creator for giving me the chance to maximize my skills. 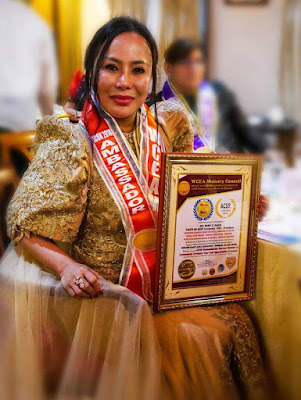 It’s also a recognition of the things I’ve done in the past, which I did for the glory of the Lord.” says Pacis. FIGRPMPTSC is an Independent subcontractor/contractor authorized and registered to provide Business Process Support and Services such as HR Services, Accounting Services, Process Audit Services, Messengerial Services, Hotel and Restaurant Management Services in various industries, Property Housekeeping and Rental Services, and Technical Support and Services. “This started as a single proprietorship company in 2003. I only had Php60,000 capital back then. From then on, I had no idea what happened next. It’s really the Lord who provided everything we needed. I just woke up one day and realized, ‘How did this happen? We have our own building and branches all over the country.’ If it’s not for the Lord, I couldn’t have done it by myself” Pacis adds. 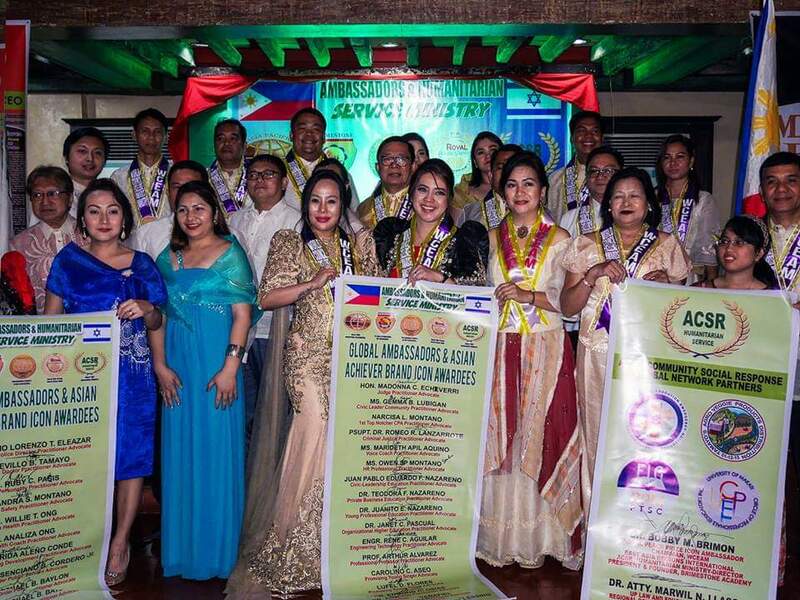 FIGRPMPTSC currently holds office in Laguna, Pampanga, NCR and Cebu. It is its sole responsibility to comply with all existing as well as future laws, rules, and regulations pertinent to the employment of top caliber employees. “Like many others, I faced a lot of challenges when we were just starting. I felt like I was in a bottle because doing a subcontracting business in the Philippines is not easy. I would say some of the players in this industry tend to take advantage of the opportunity to gain more from their employees. What I committed to the Lord is to make this company a cut above the rest and to be a company that will be righteous to its employees. I would say the biggest capitalization I have with FIG is my faith in God. With His will, I can do everything even though it seems impossible to the eyes of the people. I went through a lot of hardships but I would say a lot of these things were beyond my capacity. The Lord is our provider of strength.” says Pacis. A barefoot marathoner who loves to cook, loves to travel and chocolate maker. Web content writer and blogger as her hobby. Customer Service Representative by profession and licensed insurance advisor. 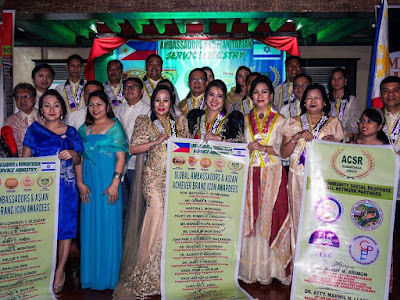 What to Expect in The 36th AGORA AWARDS?